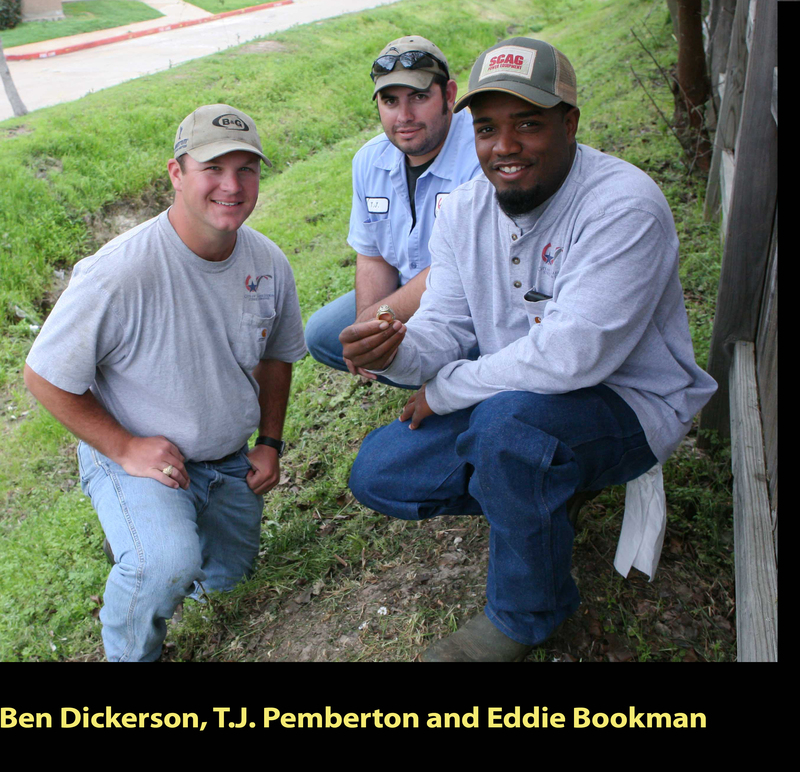 You wouldn’t think a typical drainage ditch would be a place to find lost treasure, but City of College Station maintenance crews through the years have found tons of valuable stuff in those muddy trenches: jewelry, wallets, purses, car keys, credit cards and even wads of cash are frequently uncovered by mowers and other equipment. But the three-man crew mowing deep grass in a ditch near Southwest Parkway on Tuesday came across something they never expected. Eddie Bookman, a city employee since 2004, saw something resting on the bottom 2 x 4 of a fence that ran parallel to the ditch. At first, he thought the small object was just an old mud dauber nest. But as soon as he picked it up, he knew it was something a bit more special. Judging from the imprint on the wood, the item had been there for a very long time. 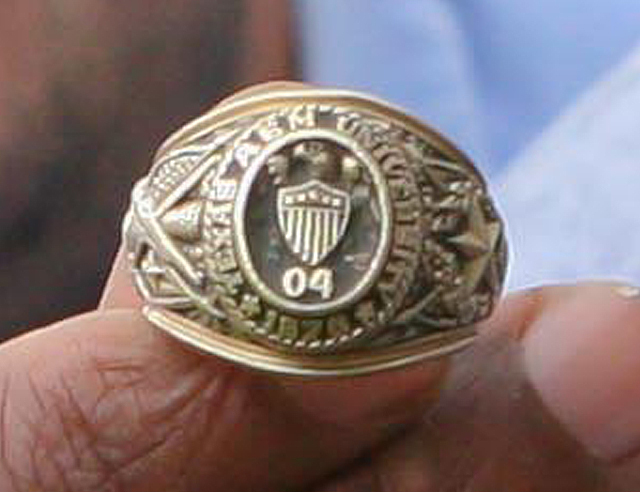 It was a mud-caked Aggie ring embossed with the year 2004. Bookman summoned his co-workers, T.J. Pemberton and Ben Dickerson, and they found the name Nicholas McClure etched inside. Knowing that Aggies treasure nothing more than their class rings, the trio embarked on a valiant quest to locate Mr. McClure and reunite him with his lost treasure. They were also curious to find out how it came to rest in such an obscure place. “I knew if I lost my ring, I’d sure want it back,” said Pemberton, a city worker since 2010. Dickerson posted the story on the Texags.com internet forum, asking if anyone happened to know McClure. A short time later, a member of the Midland A&M Club responded that, yes, McClure was from Midland and he knew how to reach him. Just five hours after they found the ring, Dickerson was chatting with a pleasantly-surprised McClure on his cell phone. McClure told Dickerson he lost the ring in 2003, just a few weeks after he got it. He recalled that he was out on a Corps of Cadets exercise of some kind and that the ring somehow slipped off his finger or out of his pocket. The heartbroken cadet never expected to see the precious piece of jewelry again. The years passed and after McClure served his country in the Middle East, he returned to the oil business in Midland. Sometime Thursday, a small, ordinary-looking package will be delivered by courier to the anxious war veteran in West Texas. Inside, he’ll find his beloved Aggie ring, maybe not as shiny as it once was, but glimmering nonetheless. This entry was posted on March 8, 2012 by City of College Station. It was filed under Public Communications, Public Works and was tagged with aggie ring, aggie ring found, City Employees, drainage ditches, lost aggie ring, public works.